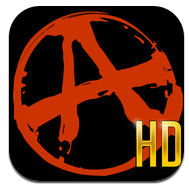 RAGE HD (v2.0) — Mobers.ORG — Your Daily Source For Mobile FUN! RAGE comes to your mobile device with the hit of the wastelands, Mutant Bash TV! This intense first-person rail shooter casts you in the starring role of a post-apocalyptic game show where you’ll be stalked by hungry mutants while you scour pulse-pounding levels for ammo and cash pick-ups. Make a deal with J.K Stiles, the show’s menacing host, and see if you have what it takes to survive this carnage-filled carnival of death! • Created specifically for the iPhone, iPod Touch and iPad . . . experience the post-apocalyptic mayhem of the RAGE universe for the first time! • Arm yourself with a pistol, shotgun or machine gun, and battle your way through three levels - the mutant-infested Tenements, the lunatic-ridden Asylum and the not so-abandoned Bunker. • Perform hit-streaks and pick up “Bash Bux” to increase your performance as you make your way through the action-packed levels, each with four degrees of difficulty. • Complete Mutant Bash TV challenges and replay levels to beat your top score. • Experience high resolution graphics, including an exclusive HD version for the newest generation of iPhone*, iPod Touch and iPad, coupled with dynamic music and sound effects.